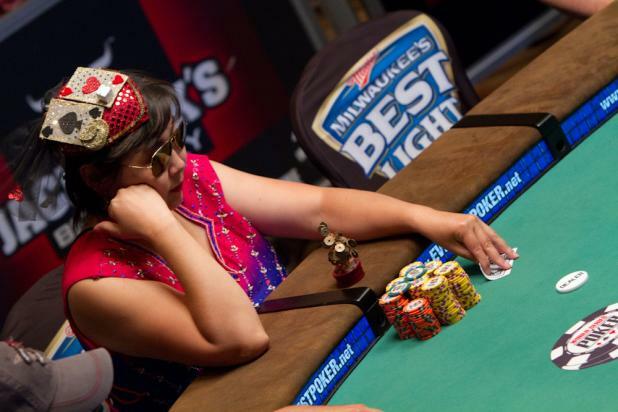 Joanne "J.J." Liu is still alive with four players remaining in Event #9 ($1,500 Pot-Limit Hold'em), trying to become the first woman to win an open WSOP bracelet since Vanessa Selbst did it in 2008. Liu's mother (foreground, right) watches her daughter from the balcony. 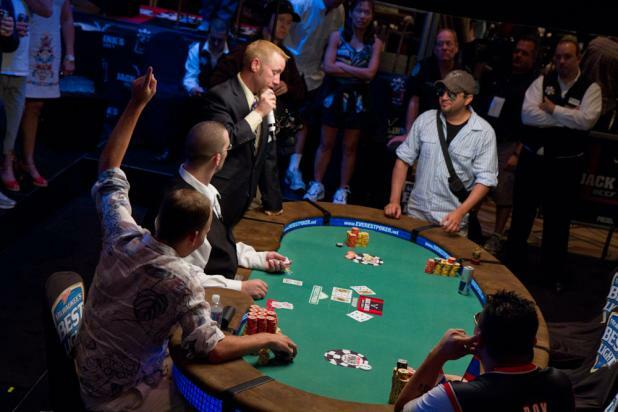 Mark Babekov (standing, top right) catches the five of spades on the turn to pick up a flush draw to go with his straight draw, and on the river he hits them both with the ten of spades. Mark Babekov wins the pot with a spade flush to double through the chipleader James Dempsey (lower left). Unfortunately for Babekov, the reprieve was only temporary, as he busted out in fourth place less than 20 minutes later. With four players left in Event #9 ($1,500 Pot-Limit Hold'em), Mark Babekov (standing, top right) is all in preflop with J-9 of spades against chipleader James Dempsey (lower left), who has pocket threes (3-3). 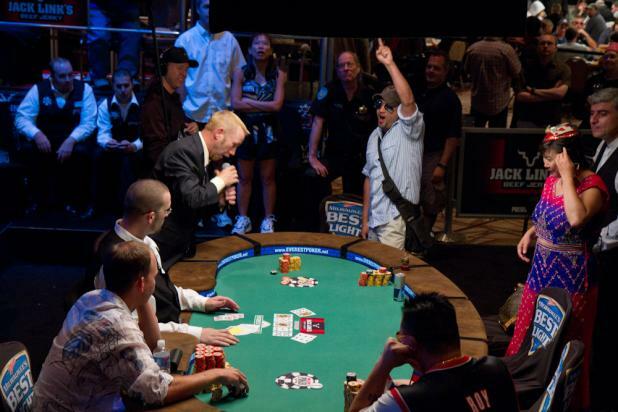 The flop came K-Q-8 with one spade, and Dempsey raises his hand as his pocket threes are still ahead. But Babekov picked up a gutshot straight draw and a backdoor flush draw to go with his overcards, and has lots of outs in the deck -- statistically speaking, Babekov is actually a 55% favorite to win the hand. 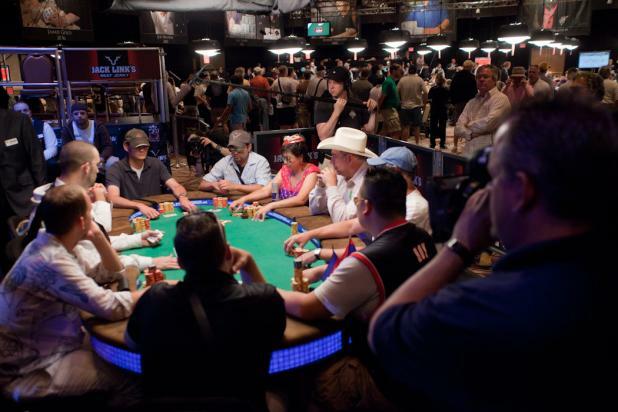 Joanne "J.J." Liu, known for her unique style at the poker table (check out her poker-themed hat), is also a respected player. This is her fourth WSOP final table (only one was in a ladies event), and her 16th WSOP cash. She has also made two World Poker Tour televised final tables, and is one of only two women to get heads up for a title in an open WPT event. (The other is Kathy Liebert.) 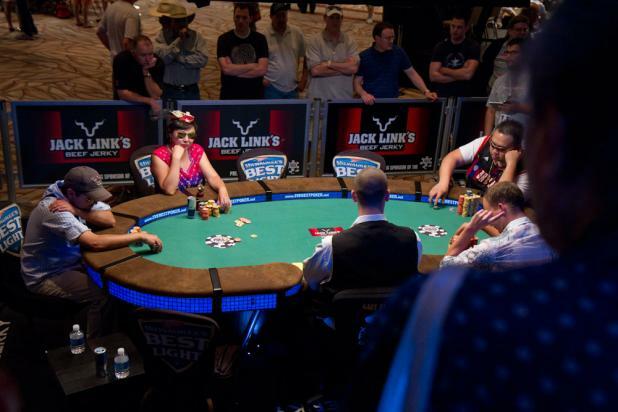 With this appearance at the final table of Event #9 ($1,500 Pot-Limit Hold'em), J.J. Liu becomes the first female final tablist of the 2010 WSOP. A two-man ESPN crew (camera operator & audio operator) is on hand to record highlights from Event #9 ($1,500 Pot-Limit Hold'em) at the secondary featured table on Saturday. 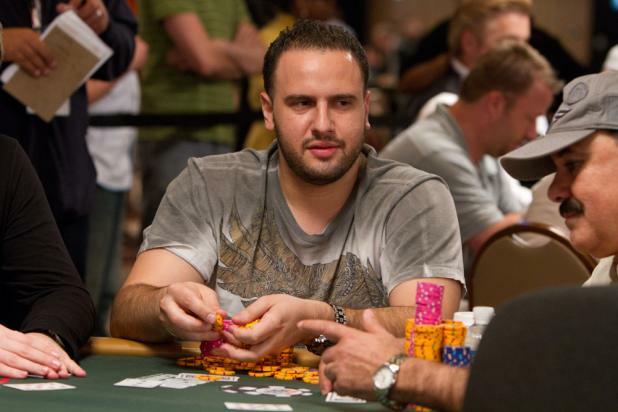 Michael "The Grinder" Mizrachi won his first WSOP bracelet earlier this week in the $50,000 Player's Championship, but he hasn't stopped there. He carried the chip lead into Day 2 of Event #10 ($10,000 Seven Card Stud), and continued his hot run to finish the day third in chips. With Vladimir Schmelev also at the top of the counts, it's possible that they could find themselves heads up for a bracelet once again. Fellow Russians Vladimir Schmelev (left) and Alexander Kostritsyn play side-by-side on Day 2 of Event #10 ($10,000 Seven Card Stud). 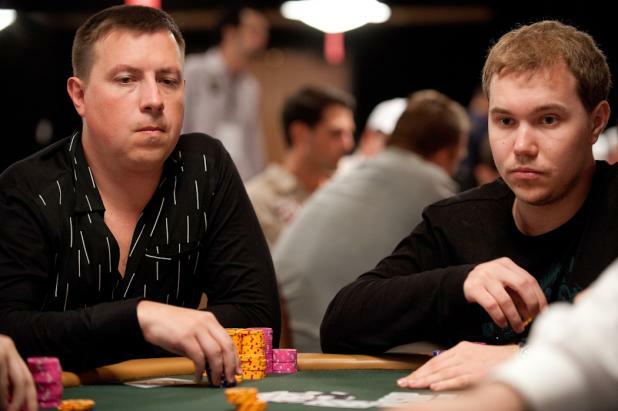 Both players are starting strong this year -- Kostritsyn finished 10th in the $50,000 Poker Player's Championship, while Schmelev finished second. Both players survived Day 2, with Schmelev carrying the chip lead into the final day. 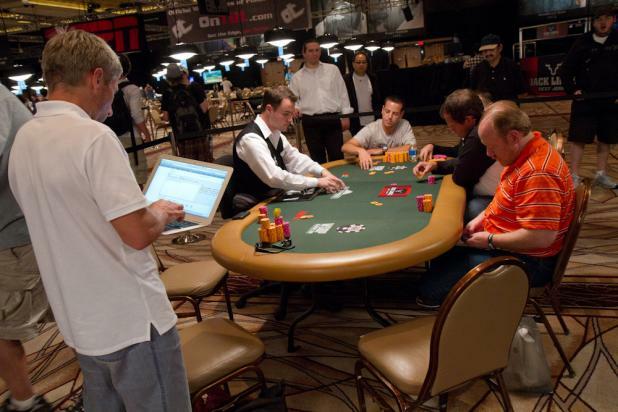 While some players keep notepads at the table to record their action, Nikolay Evdakov (standing, left) takes it a step further -- he updates his progress between hands over the internet on a MacBook Air. 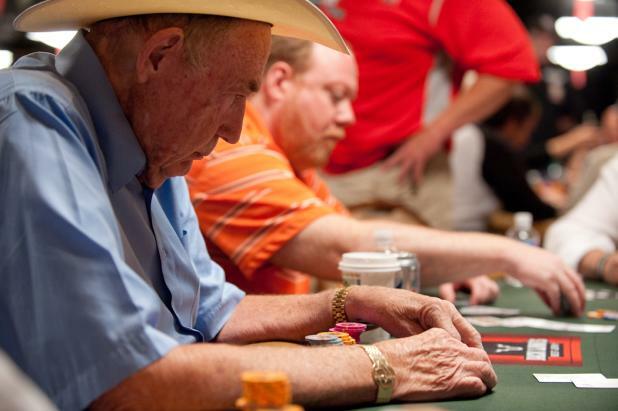 Doyle Brunson (left) and Dan Heimiller face off in a hand on Day 2 of Event #10 ($10,000 Seven Card Stud). 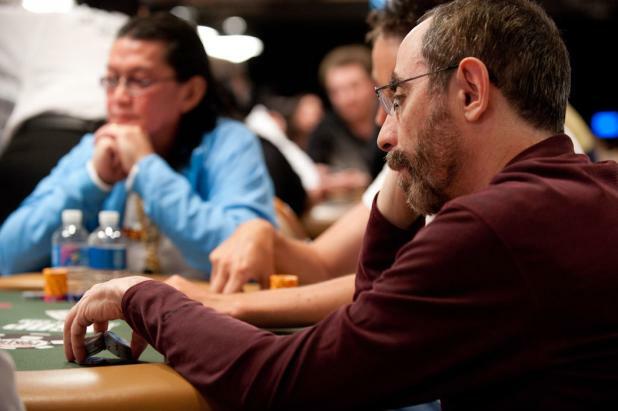 Barry Greenstein (right) and Scotty Nguyen share a table on Day 2 of Event #10 ($10,000 Seven Card Stud).